I did a Visual and Sniffatory Scan of the gravel drive. My instruments zeroed in on a target, bearing 197 degrees and 5.773 megawatts west of the yard gate. It was a smallish green hopper, of the Omega Class. I shifted into Stealthy Crouch Mode and . . .
That was Drover. His voice not only broke my concentration but it also alerted the grasshopper to my approach. He hopped away. The grasshopper, that is, not Drover. My laser-like gaze swung around and fixated on the alleged “huge one.” By George, he was huge (of the Alfalfa Beta Big Boy Class, if you’re familiar with the military terminology). He was one of those big green hoppers that can’t fly and don’t even hop very well because they’re so fat. Not only are they an easy mark, but they’re also rich in protein, vitamins, minerals, and rigamaroles. In other words, they’re the very best kind for restoring youth and energy. Speaking of which, I was running low. I could feel my precious reserves of energy ebbing away. I had to hurry. And with that, I switched all scanning devices over to automatic and shifted into Attack Mode. For those of you interested in the technical aspects, I made this approach at three knots, with ears at three-quarters alert and a stiffened tail at 22 degrees. That’s sounds pretty complicated, doesn’t it? A lot of dogs wouldn’t have gone to so much trouble for a mere grasshopper. I mean, they would have just slopped and slouched in there, but I take pride in my work. No job is too small to be little, is the way I look at it. And besides, this was no ordinary grasshopper. His Hopping Molecules were going to restore my youthful vigor. I crept forward on paws that made not a sound—nose out, tail out, and ears up. The audience was silent. Every eye was locked on the unfolding drama. I could almost feel the tension. Then . . . a voice. Sally May’s voice. Good. She was watching. I hoped she would realize that I was doing this to save her precious tender shrubberies and flowers from the Grass­hopper Plague. Yes, we’d had our ups and downs, Sally May and I, and more than our share of misunderstandings. But perhaps this selfless act of selfless devotion would make up for whatever tiny mistakes I’d made in the past. I crept toward the target on paws that made . . . I’ve already said that. Five feet away from Ground Zero, I halted, shifted my weight to a point directly over my powerful hind legs, went into a 75% crouch, tensed every muscle in my body, and took a deep breath of . . . well, air of course. I cast one last glance toward the audience. Not a single eye blinked. I had their total concentration. And yes, even Sally May was watching. My gaze swung back to the target. It was time. All my years of study and training had come down to this one moment. I dared not fail. Suddenly I exploded outward and upward—like a rocket, an artillery shell, an arrow seeking its target. My front paws landed first, as you might have guessed, and trapped the hateful grass­hopper villain. I could feel him kicking and trying to escape, but there was no chance of that. I lifted my left paw and there he was, a huge, green, hateful, yard-eating grasshopper. “This one’s for Sally May!” I yelled, and swept him up in my powerful jaws. Crunch. Crunch. Gulp. Yes! The deed was done. I turned and faced the audience. Drover was jumping up and down. Pete wore a sour smile. J.T. had his head twisted, as though he hadn’t really figured out what had happened. Heh, heh. You bet, and I’d done it all just for . . . that grasshopper didn’t taste much like chicken to me, and the longer the taste lingered in my mouth, the lesser it reminded me of chicken . . . or anything else I’d ever wanted to eat. To tell the truth, it reminded me of . . . yucko! . . . green slime and old chewing tobacco and brussels sprout juice and . . . I lifted my lips and moved my tongue around, in hopes of cleansing my mouth of . . . THAT THING TASTED HORRIBLE! What did grass­hoppers eat to give themselves such a wretched . . . garbage, rotten stinking garbage, that’s what they ate, and what kind of moron would think that this was the taste of CHICKEN? Oh, what a fool I’d been, to believe anything that Drover . . . I swallowed extra hard to get the awful green garbage taste out of my . . . GULK, WHEEZE, ARG . . . mouth, but now it appeared that something had lodged in my . . . HARK, HACK, HONK . . . throat. And fellers, all at once I could neither swallow nor draw a breath of . . . I pawed at my mouth. No luck there. I opened my mouth and fluttered my tongue around. Holy smokes, my oxygen supply was running low! I leaped into the air. I ran in a circle, using up the last of my energy supply. I could hear my body making incredible sounds as it fought to rid itself of . . . whatever it was . . . grasshopper legs, no doubt, with their barbs and spurs, and I had known all along . . . I had told Drover . . .
Water! I had to find some water! My desperate eyes fell upon the red bucket that Sally May had been using. I lurched over to it, stuck my head inside, and began lapping water with all my heart and soul. Ah-h-h-h! Sweet relief! The lump of poisonous grasshopper legs passed on down my whatever-you-call-it, the pipe that goes from your mouth to your stomach, and I hoped the old stomach was ready for what was about to hit. The Grasshopper Ordeal had left me exhausted. That was bad news, for it pretty muchly destroyed Drover’s nitwit theory that grasshoppers were full of minerals and vitamins. I sank down to the ground. I had squandered the last of my energy reserves on this deal, and now I was wiped out. 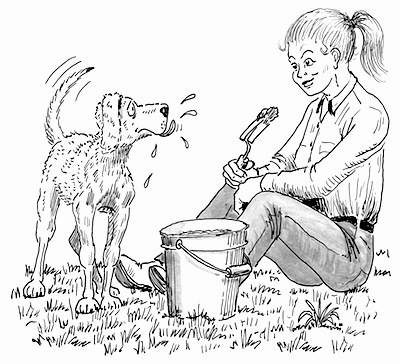 I turned my watering eyes toward my master’s wife, wagged my tail, and gave her a weak smile. I hoped she would be . . . burp . . . proud. She appeared to be . . . well . . . laughing, so to speak, which struck me as slightly inappropriate, seeing as how I had come within one grasshopper leg of choking to death. I mean, maybe that was no big deal to her but . . . by George, she was getting quite a chuckle out of my moment on death’s doormat. But why all the laughter? I had never supposed that Sally May was the kind of woman who laughed at the misfortunes of others, and yet . . .
Well . . . uh . . . water? She was biting back a smile. “It’s plant food and I don’t think it’ll hurt you, but maybe you’d better stay out of it.” She laughed and shook her head and returned to her planting chores. For crying out loud, had I escaped one form of poisoning only to fall victim to another? Actually, the stuff had tasted pretty good. I watched as she loped to the house. And, yes, I tried to forgive her for that last cutting remark—something about “dumb dogs.” That was my re­ward, it seemed, for ridding her yard of . . . burp . . . that grasshopper taste was still in my mouth. I would never eat another stupid grasshopper. The back door slammed. She was gone, but the green garbage taste remained in my mouth. My eyes drifted to the, uh, red bucket, so to speak. You know, I’d never tasted anything quite like that stuff. It had a kind of fizz that tickled a guy’s tongue and mouth, and just a hint of a sour taste, and as I sat there . . .
For no particular reason, my mouth began to water and my tongue shot out several times and . . . hmmm . . . by George, much to my own surprise, I found myself . . .
We hope you enjoyed Chapter 4 of "The Mopwater Files"!